Cook ground beef in a skillet over medium-high heat and season with salt and pepper. Halfway through browning, after about 4-5 minutes, begin mixing in the mustard, nutritional yeast, garlic powder, pickle juice, and paprika. Once cooked, taste and adjust spices as desired, and then remove from heat. 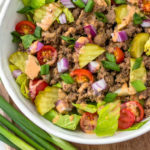 Assemble the salads with the romaine, beef, onions, pickles, tomatoes, Thousand Island and optional sesame seeds or green onion.